It was unofficially announced recently that the presidential candidate from the UNF would be the UNP Leader Ranil Wickremesinghe. This was announced during a ceremony held at Temple Trees in celebration of his birth day. During the function, a documentary on Rail was shown and in that it was stated that the only leader capable of taking the country forward is Ranil Wickremesinghe and he is the only suitable candidate. 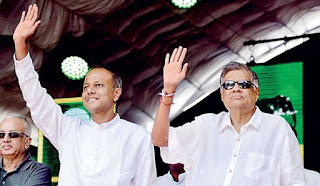 The video clip indicating that the country’s only hope is Ranil Wickremesinghe, was compiled by the Prime Minister’s Chief of Staff Sagala Ratnayake and the PM’s propaganda Secretary Ishini Wickremesinghe. However, the General Secretary of the UNP Akila Viraj Kariyawasam noted that the UNP would discuss the matter and based on everyone’s agreement they would decide on the Presidential candidate. He noted that the UNP candidate they choose would definitely win the next election. The UNP General Secretary noted that it was the opposition who had issues regarding who to nominate as the Presidential candidate, but that the UNP had no such complications. He said the next presidential candidate of the SLPP would have to be one of the Rajapaksa brothers, adding that they had no one else other than someone from the Rajapaksa clan. Meanwhile, during the media briefing with media heads and editors, Mahinda Rajapaksa said that after the UNP has named their presidential candidate he would decide on who the opposition candidate would be. “Even the UNP has still not decided. After the UNP announces their candidate we will take a decision regarding who the opposition candidate would be,” he said.